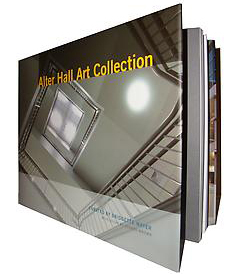 A fully-illustrated, hardbound catalogue of the Alter Hall Art Collection, featuring an essay by Gerard Brown. The art collection at the Fox School of Business at Temple University spans eight floors and 217,000 square feet. It features 29 artists, most of them from the Philadelphia and New York area along with several international artists, several artists who have graduated from Temple University's Tyler School of Art, and one painter who teaches at Tyler. The collection features original, one-of-a-kind sculptures, paintings, drawings, and works on paper as well as several large installation pieces. Published by Bridgette Mayer Gallery.